The beans are in the paper! We are pleased to introduce our new line of Gourmet Café Greetings. Each coffee themed card is embedded with roasted coffee chaff. 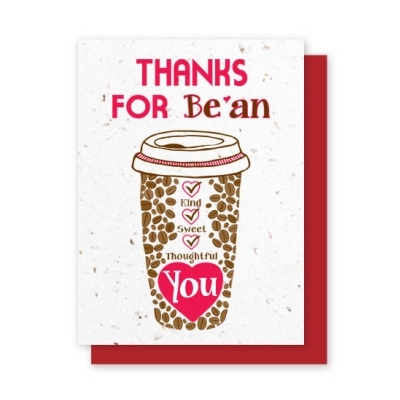 Available in various sentiments, the greetings are cleverly associated with coffee. Guaranteed to impress beverage connoisseurs and everyone in your life! The beautiful flecks appear randomly throughout the card making each card totally unique. Cards are available individually and boxed. Bulk orders can be customized.